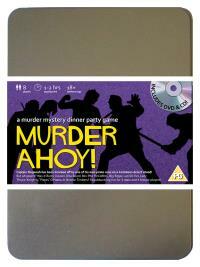 You've been invited to play the role of REV PHIL McCOFFERS in Murder Ahoy. You are invited to a swashbuckling murder mystery set in the tropical waters of the Caribbean! Captain Mugwash and his pirate crew are shipwrecked on a desert island where they find a buried treasure chest. But during a drunken celebration on the beach the Captain is discovered slumped over the chest, murdered! Please join us to find out who buried the ol’ Sea Monkey! The Hostage (he’ll take your gold before you’ve gone cold!) Costume suggestion : Smartly dressed in your preacher‟s gown and collar, you‟ve always got the good book with you to help convert the unbelievers. And if you can convert them, you also carry a small silver cup where they can make donations to pay for the sins they‟ve committed so far and put any down-payments on their future sins! I don’t think I should have to introduce myself to this filthy band of thieving pirates. I’m a man of the cloth and I’d never have stepped foot on a God-forsaken ship like the Dirty Monkey if I hadn’t been taken hostage on one of her last raids. Now I’m shipwrecked on an island in the middle of nowhere with no hope of rescue. May God save my soul!